Retain Your Data, Monetize Forever. A proprietary, pingtree-like lead distribution system that plugs directly into the form of your landing pages. Validate, capture & then distribute the leads you generate to the best matched buyer, or buyers in your portfolio. Our customers include affiliates, publishers, advertisers and email marketers who are successfully monetizing leads in verticals like Dating, Edu, Jobs, BizOpp, Finance and Health & Wellness. Internet Marketers looking to gain more control and ownership of the lead data generated in their marketing campaigns. 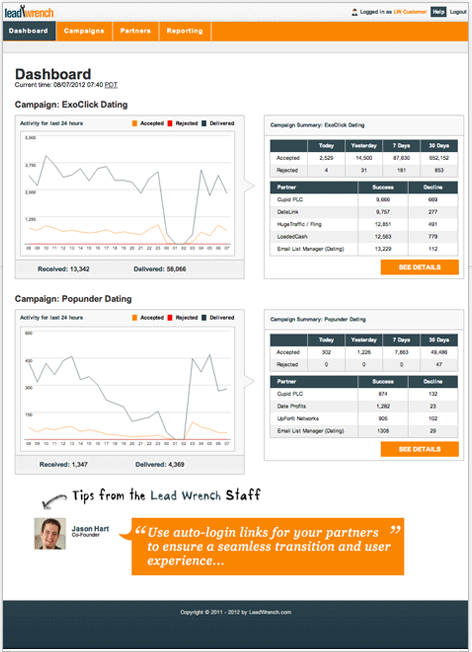 Retain full control and ownership of your lead data. Monetize better by "shopping" your lead around to ensure it is accepted by a lead buyer. Lead Wrench has provided a superb service that has really helped us capitalize on our lead generation. Their intuitive system and great staff got us up and running very quickly and we haven’t regretted it since. I highly recommend them and their service.